Mini Basketball Hoop Just $18.99! Down From $40! PLUS FREE Shipping! 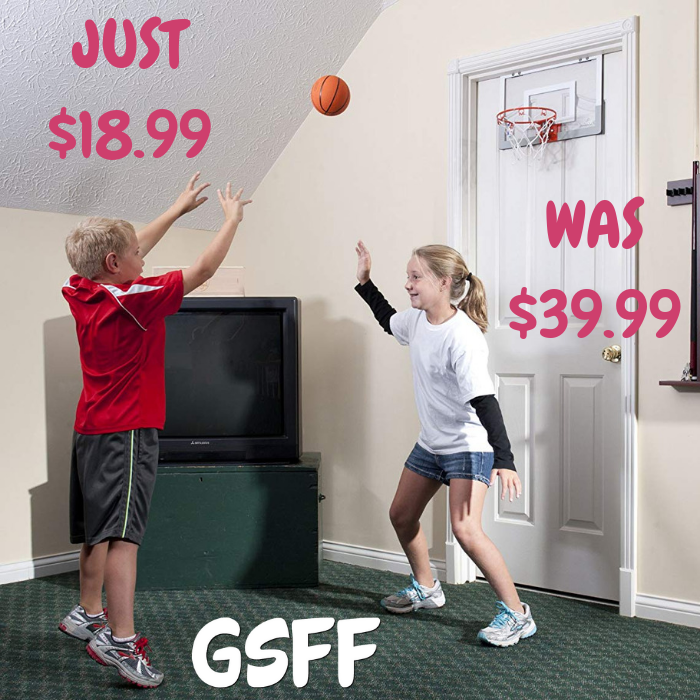 You are here: Home / Great Deals / Amazon Deals / Mini Basketball Hoop Just $18.99! Down From $40! PLUS FREE Shipping! Amazon has this Mini Basketball Hoop on sale for just $18.99 down from $39.99 PLUS FREE shipping! The NBA Slam Jam is made at a 1/4″ scale replica of actual NBA game backboard, keeping the proportions the same as the professional level backboards, and the design features a color NBA Logoman. With this set, you can get as close as possible to the real NBA experience, without having to leave your room. The NBA Slam Jam set comes complete 4″ rubber basketball, which arrives deflated. This ball is also designed with the look of actual NBA basketballs, featuring NBA Logoman graphics. This basketball system comes with padded door hooks that won’t cause damage to your doorway, and prevent scuffing that often occurs with other systems.